Last month we lost our beloved old cat after 15 wonderful years with him. Of course, following this my son wanted kittens, so after an awful cat-less month or so, I called Cambridge Cats Protection to see if they could help us. I explained our situation and was pointed in the direction of one of the Cambridge Cats Protection volunteers who was fostering a lovely grey and white Mum cat, along with four kittens. The volunteer came to see us, along with a wealth of information and advice, which I found very useful. 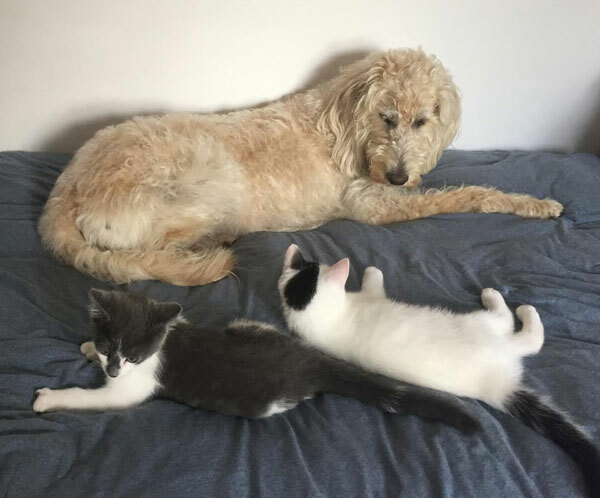 The prospect of two lively kittens along with a one year old dog was a little daunting but we were offered great advice on how we introduce the new kittens to our dog. She invited us to view the kittens and one sunny Sunday afternoon we chose Marley and Murphy to join our family. We had to wait a few weeks until they were old enough to leave their Mum and have their first jabs but that gave us time to get blankets from the kittens so that our dog could be introduced to their scent and vice versa. The volunteer brought the kittens to us and to start with they spent the first couple of days in our lounge, just swapping scents of toys and blankets with the dog and kittens. When we first introduced our dog to the kittens, Roxie, our dog, was on a lead. She was very curious and they were scared of her in that instant but she was made to sit and just watch. After a couple of meetings, the kittens were comfortable with the dog and we felt confident enough to let her off the lead. After a week or so, the kittens started sleeping with the dog in her bed, our dog took on the role of mother-hen and always was looking out for them, as she still does. Once, Roxie did a singular bark (which she never really does) to get my attention, so I dashed into the lounge to find Murphy climbing almost to the top of our lounge curtains! So nearly a month in to our journey, I can’t thank Cambridge Cats Protection enough for our two delightful little bundles of joy – I had a few questions afterwards and the Cambridge Cats Protection volunteer was very happy to answer them, so I am very grateful for all the support and advice. I had no idea that Cambridge Cats Protection would pay for their jabs, microchipping and neutering either, which was an unexpected bonus. So thank you Cambridge Cats Protection for everything – we love our new additions to our family.